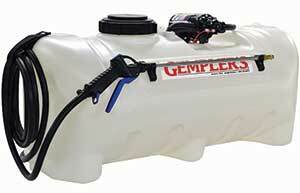 Gempler’s introduced a new lineup of 12V spot sprayers. Four models are offered with the choice of a 15- or 25-gallon tank and 1.0- or 2.2-gpm flow rate. The sprayers can be mounted to ATVs, UTVs and zero-turn mowers, as well as utility carts towed by a tractor. Manufactured using a thick polyethylene tank and more UV inhibitor, the sprayers come with high-grade pumps, adjustable spray guns and hoses, said the company.